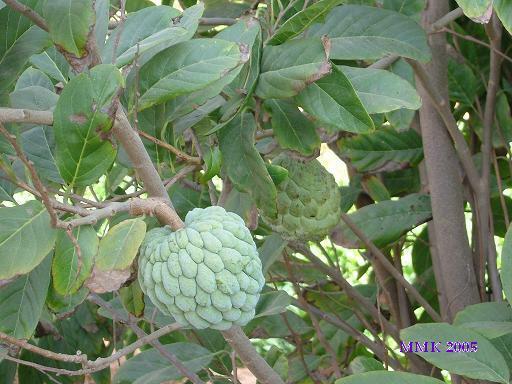 The sugar apple tree ranges from 3 to 6 m in height with open crown of irregular branches, and some-what zigzag twigs. A small (2-4'), knobby fruit with soft, creamy white flesh with a custardy flavour. 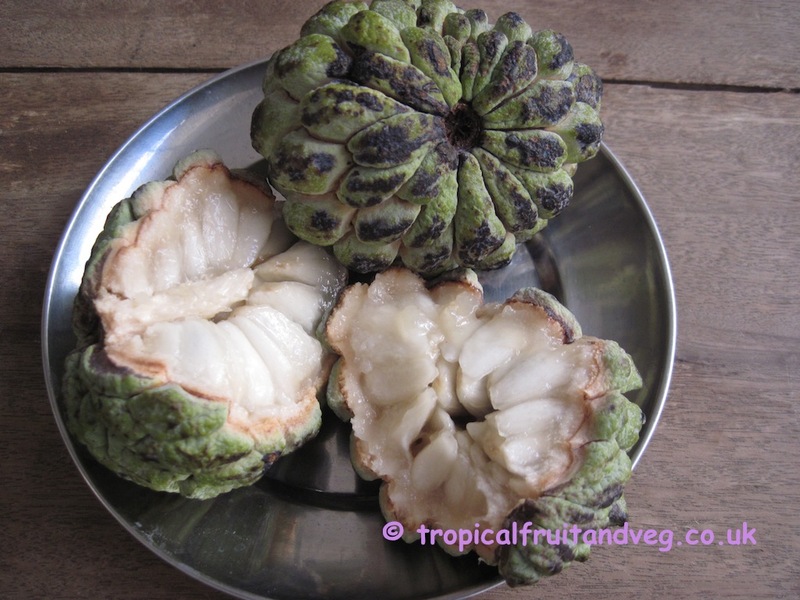 The sugar apple is extremely popular throughout the tropics. It is usually eaten fresh or used to make beverages and shakes. The sugar apple tree requires a tropical or near-tropical climate. Generally, it does best in dry areas and it has high drought tolerance. 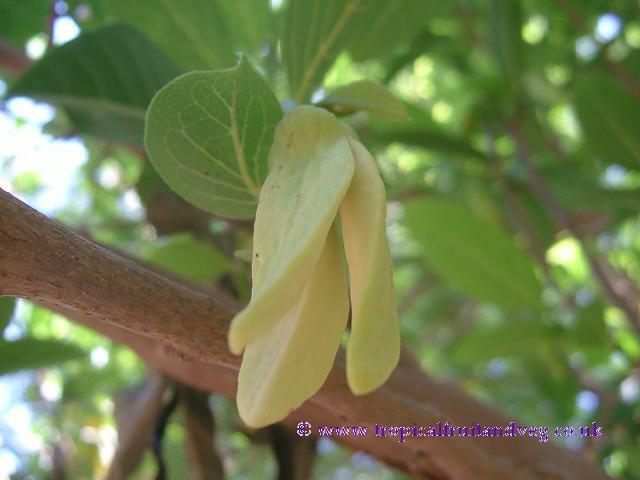 During the blooming season, drought interferes with pollination and it is, therefore, concluded that the sugar apple should have high atmospheric humidity but no rain when flowering. In severe droughts, the tree sheds its leaves and the fruit rind hardens and will split when it rains. The sugar apple is not particular as to soil and has performed well on sand, oolitic limestone and heavy loam with good drainage. Water-logging is intolerable. The tree is shallow-rooted and doesn't need deep soil. Sugar apple seeds have a relatively long life, having kept well for 3 to 4 years. They germinate better a week after removal from the fruit than when perfectly fresh. Germination may take 30 days or more but can be hastened by soaking for 3 days or by scarifying. 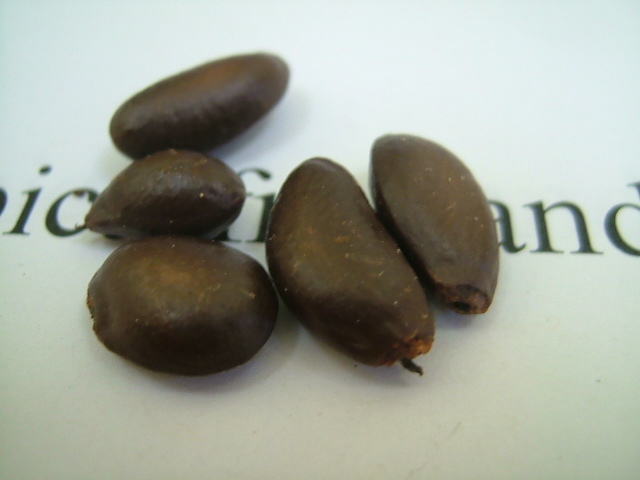 The percentage of germination is said to be better in unsoaked seeds.